Kyle Neill (right) competing for Portadown during the final season of a memorable Irish League playing career. 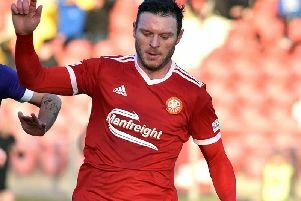 Kyle Neill’s transition from Portadown player to Glenavon coach may have taken place sooner than expected but he can draw on around two decades of past experience. Neill will reflect on a playing career in the colours of Armagh City, Portadown, Glentoran and Glenavon that secured a string of silverware. As much as his roll of honour confirms a playing career of note, the shades of grey around the red-letter days should serve as some of the greatest assets for Neill in this next chapter. The medals in Neill’s collection number the most coveted in the domestic game but even those Irish League and Irish Cup honours came as a result of having to overcome challenges and overturn negative perceptions. Neill was often valued more within the changing room than in the stands. Regularly dismissed for his limitations rather than lauded for his strengths, Neill’s consistency along the left offered a foundation of reliability that allowed others to shine. Two of his most talented team-mates - Vinny Arkins and Gary Hamilton - recognised Neill’s contribution as the former relished service to the striker simple in execution but no less effective and the latter, now his boss at Glenavon, hailed the mental strength to ignore the negativity. That clarity of focus and ability to draw on the game’s highs and lows stand as just some of the qualities Neill will now offer as Glenavon coach.